This is not the best image in the world, but at least it demonstrates how a very poor image can be improved. 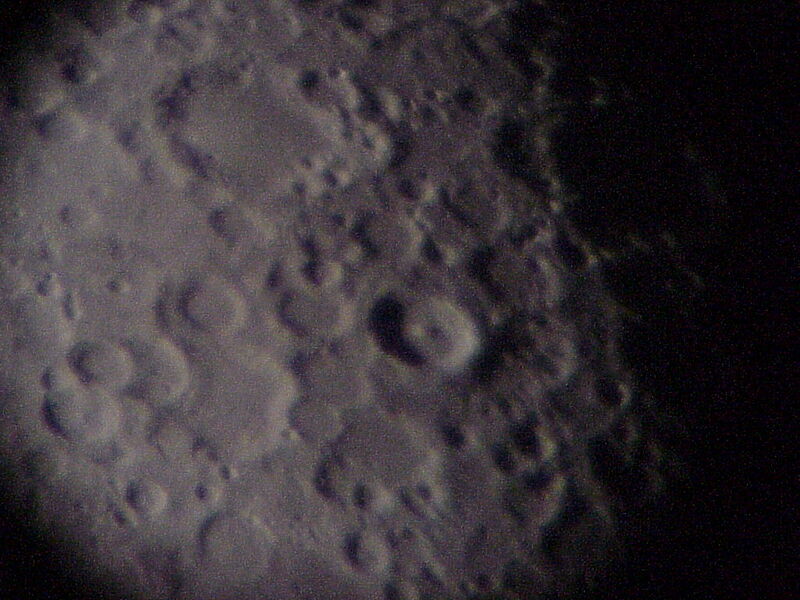 To get the above image I used a "hand held" Mavica FD91 (digital camera) held at the eyepiece of the Godlee 8" refractor at the Manchester Astronomical Society. 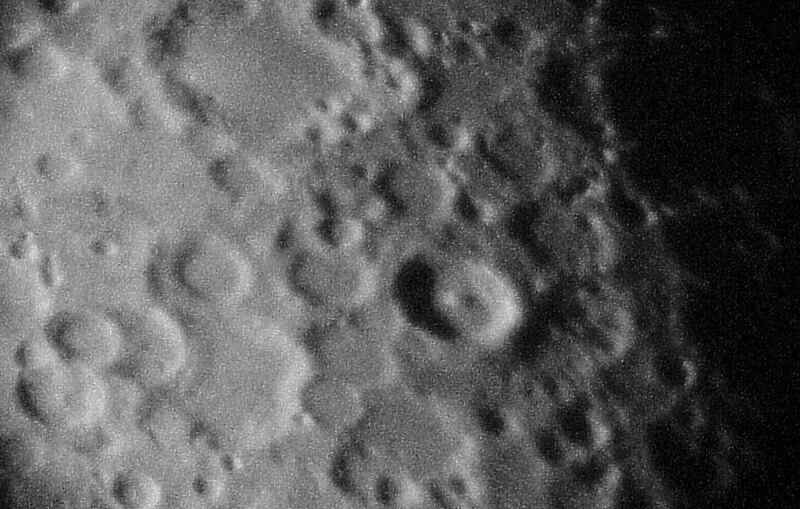 The shutter was set at 1/60 to get as much light as possible, but in this case the Moon was low down in the haze and it was not properly exposed, this resulted in an image with the 'Mavica' graininess. And the image is rather dark and the wrong colour. The focus was on automatic, and I had the lens set to approx mid focal length. It is very difficult some times to get the camera lined up with the optical axis, and if you you don't have the right zoom setting or the correct distance from the eyepiece you get alot of vignetting. This image shows some vignetting. Crop the image to remove most of the vignetting. Then using the levels control, move the input brightness adjustment to the left untill you reach the start of the histogram. Then convert the image to grey scale. Use the filter in the noise section called "Dust & Scratches" experiment with the settings untill you remove most of the speckles. At this point you may have the image you want, but in this case it was still too noisey. So to improve it further. Duplicate the layer in the layers menu. Make the layer have a transparency of 50%. Then (on this new layer) do a gaussian blur with a radius of about 1 to 3 (experiment to get the best one), now flatten the image (merge the layers) This when saved is the final image. A little tweeking with the contrast, may help to make it look sharper. Also reducing the image size often helps. I also did a bit of dodging in the corners to remove the remaining vignetting.